I recently stumbled across this collection of computational biology primers in Nature Biotechnology. Many of these are old, but they're still great resources to get a fundamental understanding of the topic. Here they are in no particular order. How does gene expression clustering work? Where did the BLOSUM62 alignment score matrix come from? How does DNA sequence motif discovery work? How does eukaryotic gene prediction work? 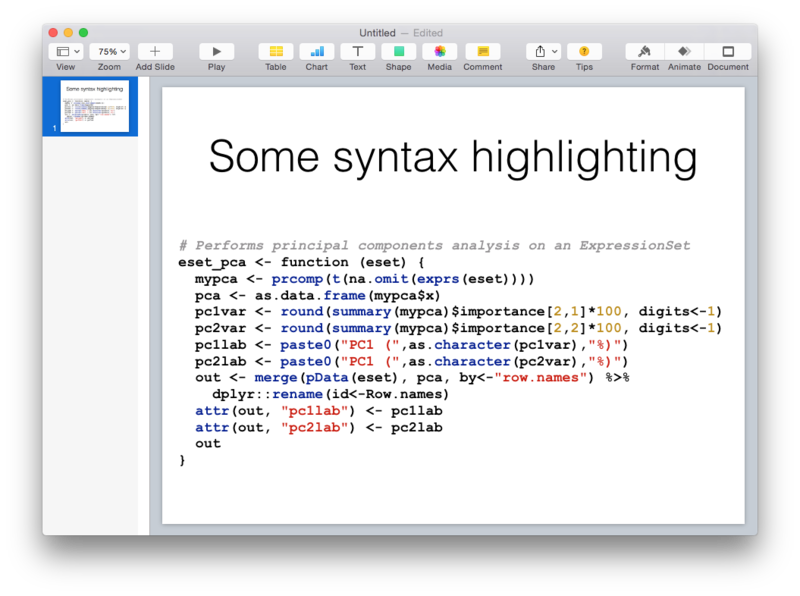 I came across this awesome gist explaining how to syntax highlight code in Keynote. The same trick works for Powerpoint. Mac only. Install homebrew if you don’t have it already and brew install highlight. highlight -O rtf myfile.ext | pbcopy to highlight code to a formatted text converter in RTF output format, and copy the result to the system clipboard. Paste into Keynote or Powerpoint. I can simply highlight -O rtf eset_pca.R | pbcopy and then paste it right into Keynote or Powerpoint. How many reads do I need? What's my sequencing depth? These are common questions I get all the time. Calculating how much sequence data you need to hit a target depth of coverage, or the inverse, what's the coverage depth given a set amount of sequencing, are both easy to answer with some basic algebra. Given one or the other, plus the genome size and read length/configuration, you can calculate either. This was inspired by a similar calculator written by James Hadfield, and was an opportunity for me to create my first Shiny app. Give it your read length, whether you're using single- or paired-end sequencing, select a genome or enter your own. 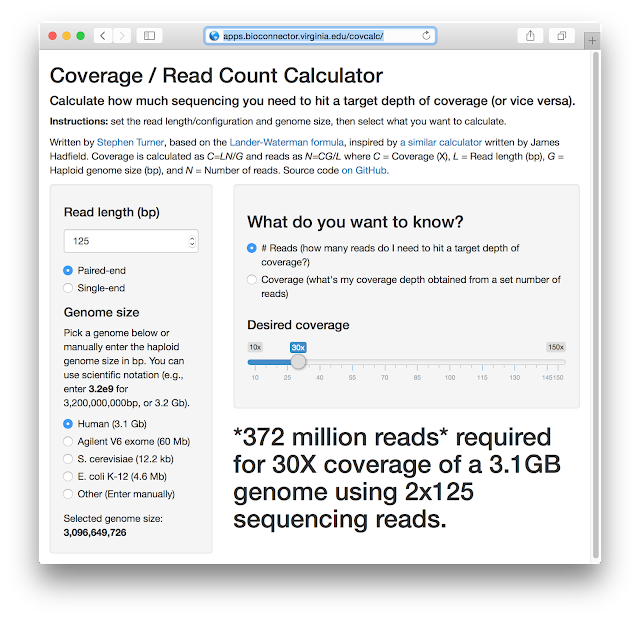 Then, select whether you want to calculate (a) the number of reads you need to hit a target depth of coverage, or (b) the coverage depth you'll hit given a set number of sequencing reads. Once you make the selection, use the slider to adjust either the desired coverage or number of reads sequenced, and the output text below is automatically updated. Last weekend I was fortunate enough to be able to participate in the first ever Shiny Developer Conference hosted by RStudio at Stanford University. I’ve built a handful of apps, and have taught an introductory workshop on Shiny. In spite of that, almost all of the presentations de-mystified at least one aspect of the how, why or so what of the framework. Here’s a recap of what resonated with me, as well as some code and links out to my attempts to put what I digested into practice. output$plot = renderPlot() is not an imperative to the browser to do a what … it’s a recipe for how the browser should do something. Shiny ‘render’ functions (e.g. renderPlot(), renderText(), etc) inherently depend on reactivity. What the point above emphasizes is that assignments to a reactive expression are not the same as assignments made in “regular” R programming. Reactive outputs depend on inputs, and subsequently change as those inputs are manipulated. If you want to watch how those changes happen in your own app, try adding options(shiny.reactlog=TRUE) to the top of your server script. When you run the app in a browser and press COMMAND + F3 (or CTRL + F3 on Windows) you’ll see a force directed network that outlines the connections between inputs and outputs. Another way to implement reactivity is with the reactive() function. For my apps, one of the pitfalls has been re-running the same code multiple times. That’s a perfect use-case for reactivity outside of the render functions. The code above works … but it’s redundant. There’s no need to calculate the “dat” object separately in each render function. The code below does the same thing but stores “dat” in a reactive that is only calculated once. "game over, man ... game over"
Adding a brush argument to plotOutput() let’s you click and drag to select a points on a plot. You can use this for “zooming in” on something like a time series plot. Here’s the code for an app I wrote based on data from the babynames package - in this case the brush let’s you zoom to see name frequency over specific range of years. # brush events on the plot using input$brush. # Plot the data with x/y vars indicated by the caller. # Handle the Done button being pressed. # Return the brushed points. See ?shiny::brushedPoints. # without the selection what is the mean life expectancy by country? Super helpful method for digging into the call stack of your R code to see how you might optimize it. Jeff Allen from RStudio gave a talk on deployment options for Shiny applications and mentioned this product, which is a “coming soon” platform for hosting apps alongside RMarkdown documents and plots. It’s not available as a full release yet, but there is a beta version for testing. A while back I showed you how to make volcano plots in base R for visualizing gene expression results. 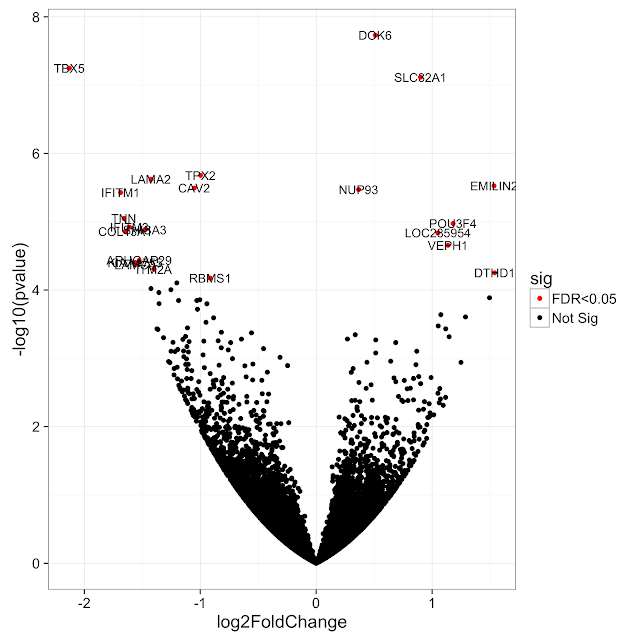 This is just one of many genome-scale plots where you might want to show all individual results but highlight or call out important results by labeling them, for example, with a gene name. But if you want to annotate lots of points, the annotations usually get so crowded that they overlap one another and become illegible. There are ways around this - reducing the font size, or adjusting the position or angle of the text, but these usually don’t completely solve the problem, and can even make the visualization worse. Here’s the plot again, reading the results directly from GitHub, and drawing the plot with ggplot2 and geom_text out of the box. What a mess. It’s difficult to see what any of those downregulated genes are on the left. Enter the ggrepel package, a new extension of ggplot2 that repels text labels away from one another. Just sub in geom_text_repel() in place of geom_text() and the extension is smart enough to try to figure out how to label the points such that the labels don’t interfere with each other. Here it is in action. See the ggrepel package vignette for more.